This service highlight, originally posted with the California Farm to School Network, is written by FoodCorps Service Member Sara Mendes who is currently serving with Life Lab and Community Alliance with Family Farmers (CAFF) along the Central Coast. Serving in the heartland of agriculture and in Spanish-speaking communities, Sara has been able to serve countless of students by teaching Harvest of the Month lessons and leading field trips. 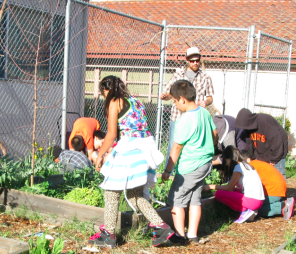 Read on to learn about her approach to teaching bilingual garden and nutrition-based lessons. “Como se dice ‘sour’ en español?” I ask my first grade students. “Amargo!” someone shouts. “No! That means bitter. Agrio!” another voice suggests. “Agrio,” the class agrees. I write the word in English and Spanish on the whiteboard where we are very scientifically documenting how two varieties of local kiwi taste. As a FoodCorps service member in Watsonville, CA, nearly 70% of the students I see are English Language Learners (ELL) and native Spanish speakers. During the two years before I began serving with FoodCorps, I had the opportunity to work as, and learn how to be, an educator with various nonprofits in New York and California. However, working in classrooms with such diverse English language capabilities has flipped everything I thought I knew about teaching on its head. Despite the challenges of my rusty Spanish skills, guest educator status, and the distractions of working outside, I’ve realized that my position has handed me all the tools I need to work with ELL students on a silver platter. What better way is there to engage with ELL students across cultural and linguistic barriers than by tasting, sharing, making and growing food? I can’t count how many times I have heard this phrase repeated throughout my service. However, its great advice. After a few minutes of research I realized that there are countless teachers, blogs, academic papers, and curriculums that can provide fantastic tried and true methods for integrating ELL students into mainstream classrooms and the garden. From how to maintain attention, gauge understanding or figure out what lessons to try out, taking the time to have conversations and to read about what has been done has vastly improved my skills as an educator. If you’re interested, check out some of these links: English Language Development in the Garden, Schoolyard Inquiry for English Language Learners, and Agricultural Worksheets for English Language Learners. Sometimes, the students whispering non-stop throughout your whole lesson are not in need of discipline, they are translating everything you say. As obvious as this seems in retrospect (and as embarrassing as it was in context), it took a mistake to teach me to be more aware. As a student, I always thought our whispers, doodles and space-out sessions were unnoticed by our teachers. As an educator, its amazing how much you can learn by paying attention to your students: what are they understanding, what is keeping them engaged, who is not as engaged and why? Keeping an eye out has helped me to find new strategies that keep all students engaged. In a classroom where almost all of the ELL students are fluent in Spanish, it has encouraged me to cater my lessons to Spanish speakers, but to open room for the minority of students who may be fluent in other languages like Mixteca, or Vietnamese. Providing an opportunity for one student to share a word from their language or a recipe from their family can be a great way to engage students who are not always directly targeted. I can spend hours preparing a lesson, and sometimes it goes off without a hitch. In January, many of my classes read a short story about the geographic history of the kiwifruit. They engaged with the text by filling in maps, writing descriptions and answering questions, connecting a classroom taste test with their curriculum. In some classes, I quickly realized that the text-based activity would not be as effective. 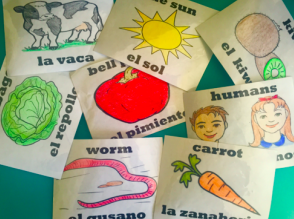 I thought back to other lessons that I’d seen and rummaged through my bag for a pile of fruit and vegetable cards that conveniently labeled each fruit in both English and Spanish. After a quick review of the English and Spanish word for each color in the rainbow, my students were laughing and learning as they raced to sort the cards by color. Being flexible means also being prepared. Always have a back-up activity in mind. Whether you have too much or too little time, students aren’t engaged or understanding, having a back up plan can stave off disasters! I have also learned that having a list of keywords in English and Spanish for each of my lessons can help me engage with students and increase participation. In some situations, asking students to translate for their classmates has been a way to keep students engaged. However, I know that I can’t always expect them to know how to (or want to) translate every word or phrase I throw at them. Putting in the effort before hand has made it easier to communicate with and engage my students. Standing at the front of the class and lecturing has worked in some of my classrooms, but those are never the most successful lessons. Working with ELL students has taught me to make sure every lesson has elements that are visual, hands on and engaging. Whether we are tasting and describing new fruits and vegetables, creating artwork, doing scavenger hunts in the garden, planting, or singing and dancing, my students are rarely just sitting in their seats listening to my voice. In the garden or in the classroom tasting food, farm to school educators have so much to work with. These changes have made lessons more fun for all of my students, regardless of their English language skills. Today I expect to learn at least as much from my students as they learn from me. My Spanish vocabulary grows with each new lesson, and I always welcome translations and corrections to my Spanish grammar. I can now easily recall most of the words that we often use to describe the looks, smells, tastes, and textures of the fruits and vegetables we try as well as words for the tools and actions we perform in the garden. I have noticed that my students have felt more confident answering questions in English as well. Beyond language, I’ve learned how many of the fruits and vegetables we’ve tried go well with pozole, how many students love zucchini with chile powder, and how many did not really care for kiwi. I’ve also learned about the work many of their parents do to harvest lettuce, strawberries or kale from the many farms that surround their Watsonville community. Finally, though I am still not an expert, I’ve learned how to make my teaching more fun for everyone. The tips and skills that make working with ELL students easier have undoubtedly made me a better teacher for all of my students.